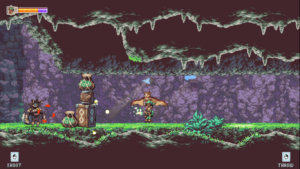 Owlboy is a puzzle, platformer, two-dimensional free movement shooter released in 2016 for the Steam platform. 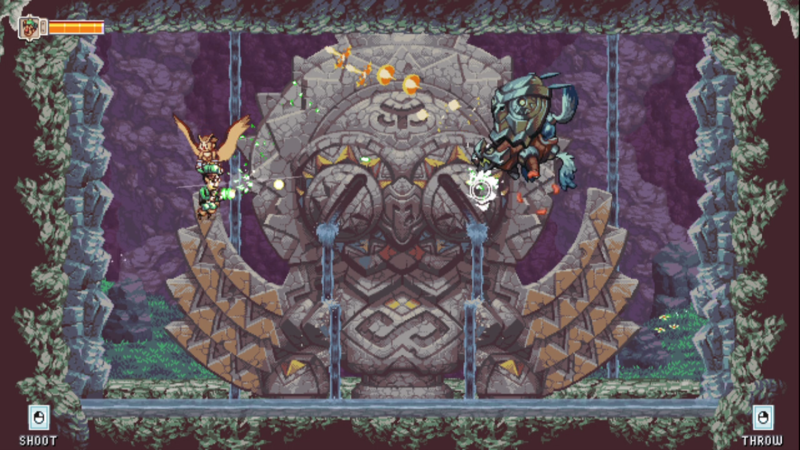 It was developed and published by D-Pad Studio. 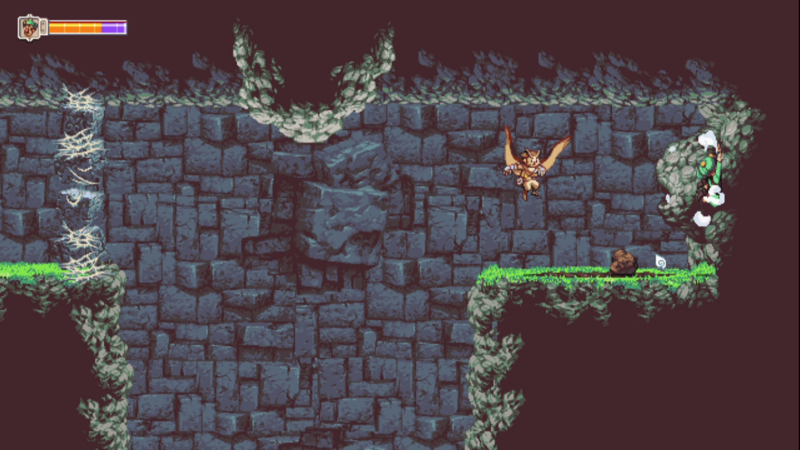 With a rich though linear storyline like you might find in a JRPG, Owlboy blends many genres and integrates game mechanics from many types of games. 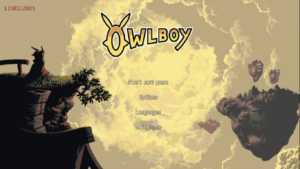 Owlboy follows the adventures of a mute owl by the name of Otis. Given Otis’ disability, he is bullied by his peers and has a hard time living up to the standards of the town leaders. Overcoming disability and standing up to bullying may turn out to be a theme throughout the game. The game begins with the player flying around the village of Vellie getting to know the villagers and serving as a look out for pirates. The villagers inform Otis of a troublemaker who has been plaguing the town. Eventually the player explores to the point where the bully owls frighten and intimidate Otis. The local tinkerer named Geddy comes to Otis’ defense and they team up to explore together. At that point Geddy becomes part of the player’s party and Otis can pick up Geddy to fly him around. Pew Pew, Take that Troublemaker! Otis flies around using the W, A, S, D keys. Geddy has a pea shooter than can be used to shoot at enemies and objects. It is particularly effective when shooting anything that is wooden. The player uses the mouse to aim and the left mouse button to fire. 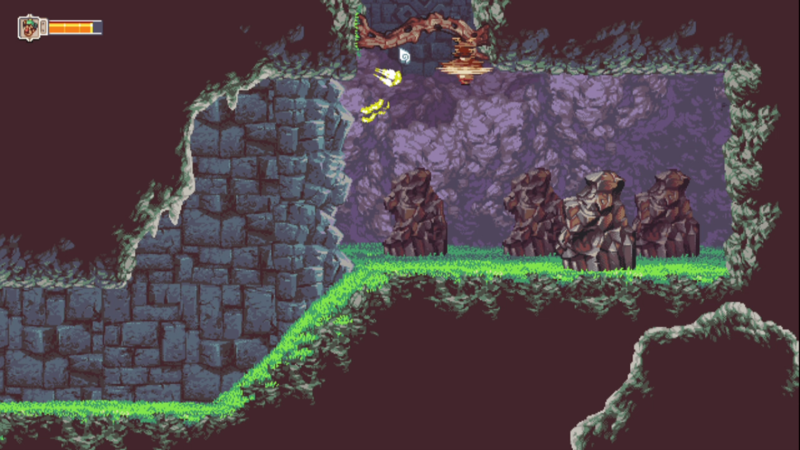 Most of the game controls are well labeled on screen whenever they may be used to interact with the environment. After all of the villagers have been greeted and another owl has been saved from bullying, Otis and Geddy encounter the town troublemaker and chase him down to a cave where the real game begins. The first area is fairly simple to navigate and serves as a tutorial to help the player learn all of the game mechanics and get used to the style of puzzle solving that will be expected later. 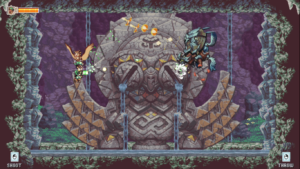 Geddy can be picked up and flown around and is useful for firing on enemies. His pea shooter kills most enemies I have encountered thus far and annihilates dry old tree trunks. When not carrying Geddy, Otis can use a spin attack that can only stun enemies, but can also be used to break rocks which are impervious to the Geddy’s pea shooter. It is in this area that the player learns the strengths and weaknesses of each character’s abilities. 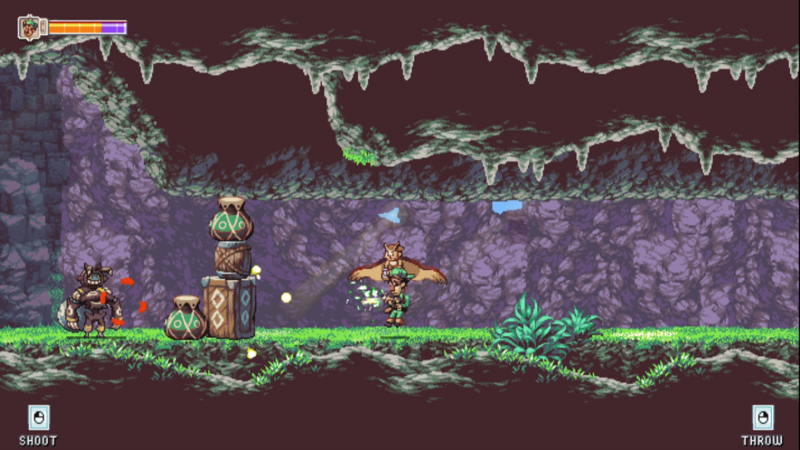 Similar to Super Mario Bros. 2, health is boosted and restored in Owlboy by pulling produce out of the ground and eating it. Whenever I have encountered something growing out of the ground, I have found it best to go ahead and eat it to get a larger health bar. The first boss wasn’t as easy as I tend to expect a boss to be immediately following a tutorial. There was a good deal of trial and error as I worked to determine which character needed to fire in what way in order to cause the boss damage. I don’t recall seeing any health bar for the boss to indicate how much damage was being dealt, nor was there any particular difference that I could detect in the flashes that came from shooting the boss with Geddy’s pea shooter and using Otis’ spin attack. It eventually became clear however that the first boss had armor in the front that could not be penetrated. It that had to be kicked off using Otis’ spin attack from behind. Then once the armor was off, Otis’ had to be carrying Geddy in order to shoot the boss with the pea shooter. Once I figured out the pattern, defeating the boss wasn’t at all hard, but definitely provided evidence for an interesting game going forward. Throwing Geddy into a stone wall. This is fun. Upon defeating the boss, the player gains an artifact that allows them to press a button to transport Geddy to Otis’ location from wherever he happens to be. This is an extremely helpful mechanic as I was worried about losing him throughout most of the game leading up to the first boss. In many games any companion received must usually be handled with care. 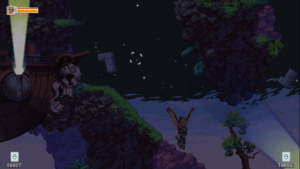 In Owlboy it appears you can slam Geddy against any wall or throw him off cliffs with great comedic slapstick relief and he will come back with no issue. Geddy looks fragile, but he can take a real beating. Once Otis and Geddy get back to town after chasing the troublemaker and defeating the boss, they find the village riddled with pirates. The pirates seize an artifact that will help them attack the capital of Advent and they leave to do so. Otis’ mentor Asio leaves with the village professor to warn those at the capital while Otis and Geddy are tasked with going to the ancient Owl Temple to discover if there is a way to defeat the pirate fleet with the old owl technology. Owlboy’s graphic style is reminiscent of 32-bit platformers released in the mid to late 1990s. The parallax looks phenomenal. The sound is what I would expect and suites the story. 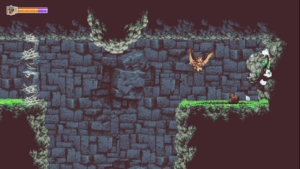 In many ways Owlboy is a typical puzzle platformer that delivers everything I would expect in a predictable manner. But just when I guess where I think it is going, it has so far surprised me with a little twist here or extra unexpected depth there. This also seems to be a good title for adolescents. The content so far seems safe while the challenge provided is worthy and not too easy. The game is rated E10+ by the ESRB, so I’ll leave that to parents to decide. I certainly have enjoyed playing Owlboy thus far, and look forward to continuing the adventures of Otis and Geddy again soon.